RVHS junior Brandon Call (11) attempts to evade a tackle during the Raiders 54-28 setback to Nelsonville-York on Friday night in Bidwell, Ohio. BIDWELL, Ohio — A tough start to conference play for the Raiders. 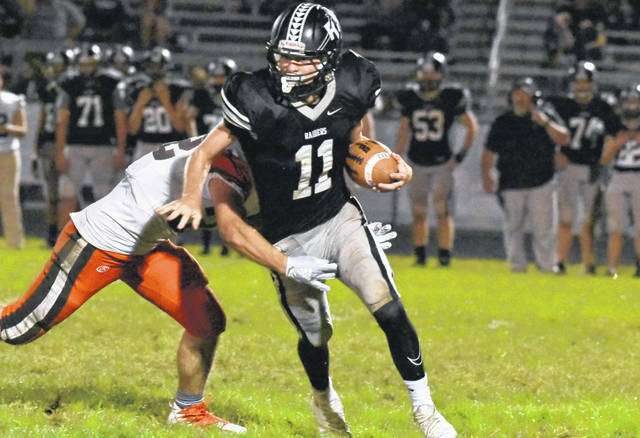 The River Valley football team put together a spirited performance in the first quarter, but visiting Tri Valley Conference Ohio Division foe Nelsonville-York simply had too much offensive prowess to overcome, as the Buckeyes rolled to a 54-28 victory on Friday night in Gallia County. The Raiders (0-4, 0-1 TVC Ohio) trailed 14-7 entering the second quarter, but NYHS (1-3, 1-0) junior Keegan Wilburn’s 14-yard touchdown run with 5:00 remaining until the intermission propelled the visitors to a 20-7 advantage. 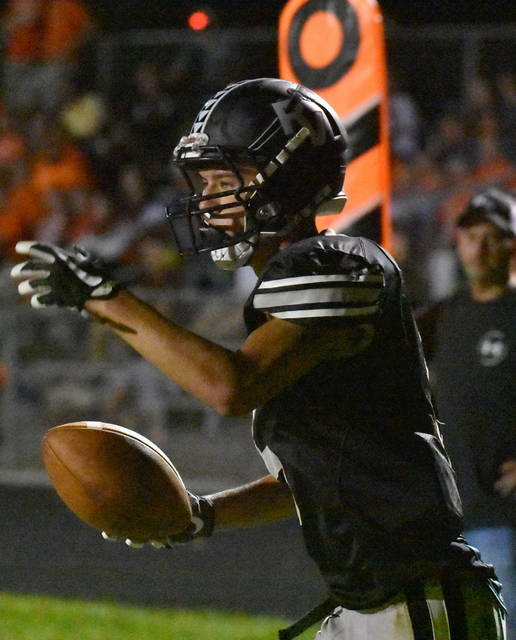 RVHS cut the deficit to 20-13, when Jordan Burns connected with Jared Reese on a 5-yard touchdown pass with 42 seconds remaining in the half. The Buckeyes posted their fourth touchdown of the contest when Wilburn scored on a 45-yard pass from Mikey Seel to extend the lead to 27-13, with only 20 second remaining until the break. 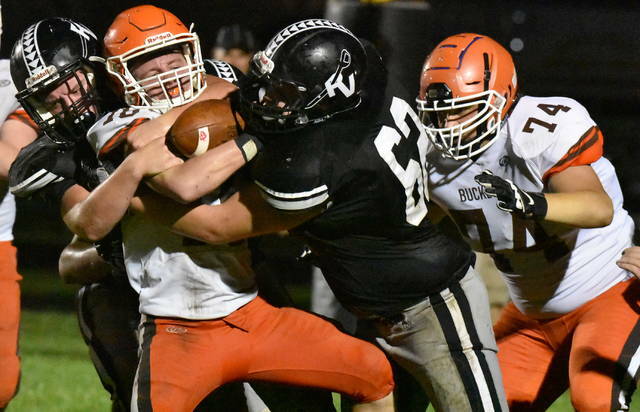 Nelsonville-York added three additional touchdowns in the third quarter — while the Silver and Black were held scoreless — to widen the margin to 47-13 entering the finale. The Raiders narrowed the lead to 47-20 with 11:36 remaining in the fourth, as Burns connected with Brandon Call on 47-yard touchdown pass. NYHS, however. pushed the advantage to 54-20 just 1:10 later, as Wilburn provided a 67-yard touchdown run. RVHS added its final points of the game, with 8 seconds remaining, when Reese scored on a 47-yard run and a successful two-point conversion on a catch from Burns to close out the 26-point setback. Layne Fitch led the Raiders with 68 rushing yards, while Reese followed with 63 yards. Burns completed 6-of-13 passing for 100 yards, including two touchdowns. Four different River Valley players caught at least one pass in the setback, with Call leading the way with two grabs for 55 yards. Dylan Lemley also had two catches for 24 yards, while Colton Gilmore and Reese each added one reception for 13 yards and 8 yards, respectively. Next up for the Silver and Black, a road date with TVC Ohio Division foe Meigs on Friday.